"The World Can’t Wait organizes people living in the United States to repudiate and stop the fascist direction initiated by the Bush Regime, including: the murderous, unjust and illegitimate occupations of Iraq and Afghanistan; the global “war of terror” of torture, rendition and spying; and the culture of bigotry, intolerance and greed." We are told that the Republicans are waging a war on women. It is true that they are on an endless quest to restrict access to abortion, if not outlaw it altogether, and want to prevent insurance companies from paying for contraception. In Wisconsin, the Republican governor recently signed legislation which repealed that state’s equal pay enforcement act. The Republicans deserve the label, but if there is a war on women in America today, it is being directed primarily at black women as a group and at their young children as well. Black women have been criminalized for the most minor of offenses, for enrolling their children in schools outside of their home districts, and even when their children are victimized by other people. Calls for harsh treatment of immigrants by right-wing politicians are so common they've become part of the background noise for many people. Yet a Council of Europe report presents evidence that NATO has implemented a policy that goes beyond what even the most openly far-right politicians dare publicly propose: sentencing migrants to death. The Whole Damn System is Guilty! Find out more about this case and contact the Chatham County District Attorney today. 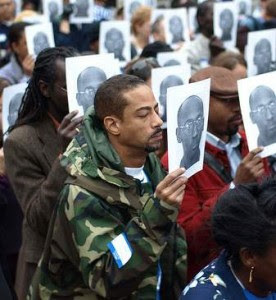 IT IS TOTALLY FUCKED THAT TROY DAVIS IS SCHEDULED TO BE EXECUTED TOMORROW! 7 out of 9 witnesses against him recanted. Tremendous evidence points to his innocence and makes clear he did not receive anything approximating a fair trial or justice. Asalam Alaikum, peace, sisters and brothers. I stand here before you today as an Italian American Muslim, in solidarity and with respect for all communities of faith, and those who simply believe it is a basic human right to live in peace and with justice. I not only represent a broad coalition which formed to denounce Islamophobia, and I am not only a mother of a US Marine who thought he was being patriotic by joining the military only to be destroyed psychologically and emotionally, but most importantly I stand here as a human being who cares about the future of humanity and this planet. On Wednesday, March 9, Republicans in the Wisconsin State Legislature rammed through Governor Scott Walker's bill to essentially break public employees unions. The bill amounts to an 8 percent pay cut for most public workers, and big increases in payroll deductions for medical insurance and pensions. Even more ominously, the bill effectively strips public service unions of their right to represent workers in anything but the most limited wage negotiations. For more than three weeks, as many as 100,000 people from Wisconsin and beyond poured into the streets of Madison. They surrounded the State Capitol, marching, chanting, and playing music. Thousands occupied the Capitol building itself. Their defiant protests and rebellious spirit captured the imagination of and inspired people around the U.S. The occupation of Madison set off smaller protests in other states and was even greeted by signs of support in Cairo's Tahrir Square. Store food and prepare for the coming global insurrection: That's the warning Glenn Beck issued Monday. The Muslim Brotherhood and American radicals, he informed us, are operating in tandem to bring about "the destruction of the Western world." On his Fox show, Beck presented a clip of Mohamed ElBaradei calling for a "New Egypt that is democratic, that is based on social justice." The phrase "social justice" flashed on the screen, because in Beck's world, it's a code word for a totalitarian leftist agenda, just as the Egyptian protesters' use of the phrase "day of rage" signals their kinship with Bill Ayers of the Weather Underground. "We've shown you tonight that Hamas, Code Pink"—the feminist anti-war group—"and the Muslim Brotherhood are all linked together." With the future bleak, Beck called on his viewers to pray for "our way of life" and for Israel. Defend Dr. Frances Fox Piven! After more than a year of sustained vilification of and emotional provocations against Frances Fox Piven by Fox News commentator and Tea Party hero Glenn Beck, Dr. Piven has become the target of very serious, and very vicious, threats against her life. "ONE SHOT... ONE KILL! "… "Why is this woman still alive?" "Maybe they should burst through the front door of this arrogant elitist and slit the hateful cow's throat." These were among dozens of open threats to Dr. Piven's life that were allowed to sit for weeks on Glenn Beck's website, The Blaze. Meanwhile, Glenn Beck has only continued to fuel the invective atmosphere of violent anger against Piven through his ongoing distortion of her work and his open mockery of those who have expressed concern for her safety. As the new year opened, the outgoing head of public education in Arizona, Tom Horne, issued an official “finding” declaring that the Mexican American Studies program in the Tucson school district, one of four ethnic studies programs in that district, was in violation of a new state law that had just gone into effect. The finding by Horne—now the newly elected Arizona state attorney general—gave the Tucson school district 60 days to “comply” with the law. And the finding threatened that “the only way in which compliance can be effective within the next 60 days is by elimination of the Mexican American Studies program.” The Tucson school district could have 10 percent of its budget taken away, amounting to about $15 million, if it does not eliminate the program. Judson Phillips runs one of the largest Tea Party social networks, and thinks too many young and poor people are voting. So he'd like to change the Constitution. When Tea Partiers talk about the U.S. Constitution, it's usually with a sense of veneration for a document that's seen to be divinely inspired, written by a group of seemingly infallible Founding Fathers. That sense of Constitutional mysticism, however, may only -- for at least one Tea Party leader -- extend to the document when useful for accusing liberals of violating it. By now, the events leading up to the suicide of Tyler Clementi, a gay student at Rutgers University in New Jersey, have been widely reported. On September 19, Tyler asked his roommate, Dharun Ravi, to stay out as he was having a private guest.